Southern In Law: Happy Easter! Happy Easter, from the Southern In-Law family - to yours! 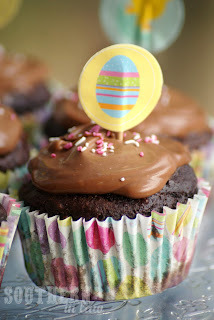 Today we're celebrating by having a barbeque with friends complete with my Healthy Chocolate Cake made into cupcakes! The best thing about these chocolate treats? They're super simple to put together. The brownies require no mixer or funky ingredients (the healthy secret is the applesauce!) and the cadbury philly just needs to be spread on top! The quickest, easiest and most delicious dessert ever! But tell me, how are you celebrating Easter this year? Hubba hubbaaaa that chocolate top oozing out looks so scrumptious. :) And I never really did much for Easter except a few things at church! I didn't grow up celebrating anything though because my family is super Asian and isn't used to doing anything else but work on holidays, so that was never an option. But I noticed I've been trying to do more memorable things ever since I got married to Greg, so I think our little family will be different in that sense. 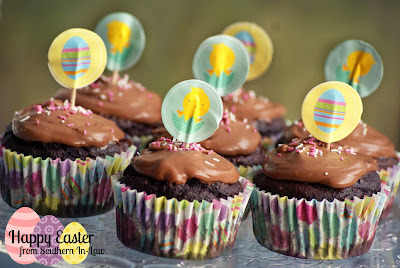 :D Happy Easter and have a wonderful day!! Happy Easter to you too, lovely! Oh I am feeling the same - we're having an extra extra long weekend as it's Jesse's birthday on Wednesday!